How many liberal newspapers are left? Saw in the news that the Seattle Times endorsed for Congress a Repub with ties to the militia/patriot movement–violent right wing nuts. I liberal Seattle has a hard right newspaper, how many cities have a Dem leaning paper left? I realize that Seattle has a big Defense industry economy, but that was my question. 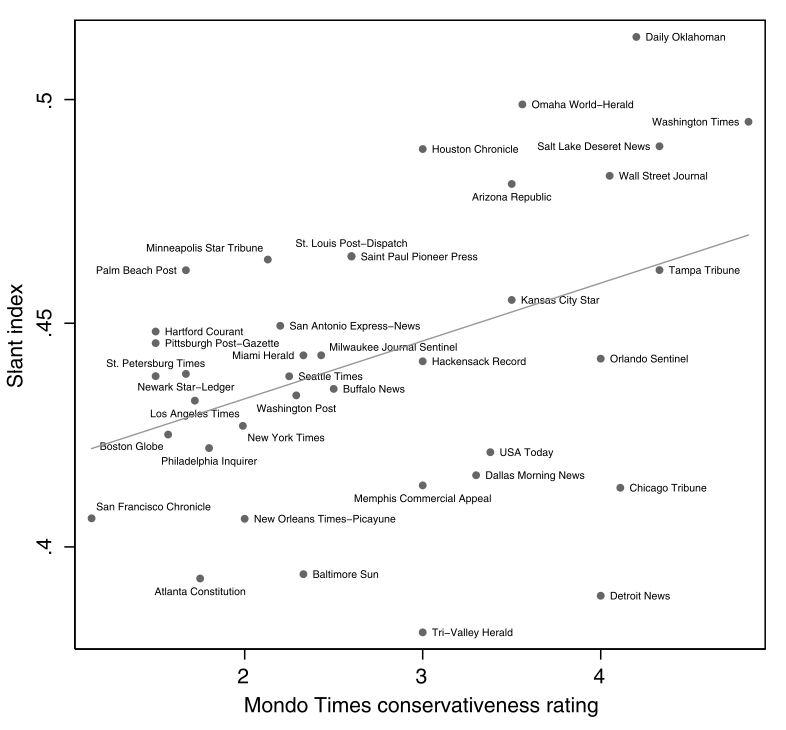 I found this graph listing newspapers and giving them a score. I don’t follow enough papers to have a feel for how good a measure this is. I would place the Washington Post on the conservative side of the line, the NYT in the middle (painfully in the middle). Which doesn’t leave many liberal (or even Democratic) big city newspapers–the LA Times, Chicago Sun-Times, Denver Post, San Francisco Chronicle. I don’t know enough about the Atlanta Constitution, Boston Globe, or Philedelphia Inquirer to have a feel for their content.